Class 319/3 No. 319369 at St. Albans. (c) Peter Skuce. Class 319/3 No. 319381 at St. Albans. (c) Peter Skuce. Class 319/3 No. 319369 and No. 319368 at St. Albans. (c) Peter Skuce. Recently mechanically overhauled Class 319/3 No. 319371 at St. Albans. (c) Peter Skuce. 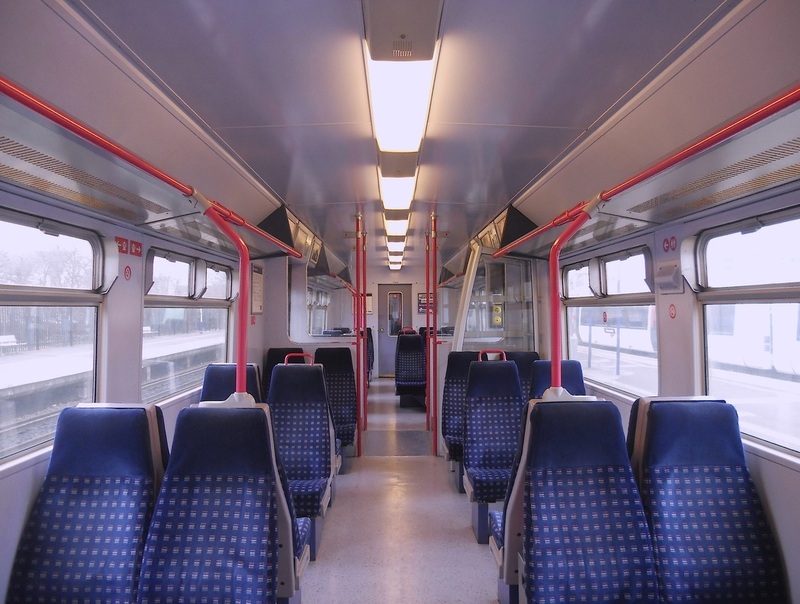 The interior of the refreshed DTSO vehicle. (c) Peter Skuce. Class 319/3 No. 319364 'Transforming Blackfriars' at St. Albans. (c) Peter Skuce. Class 319/3 No. 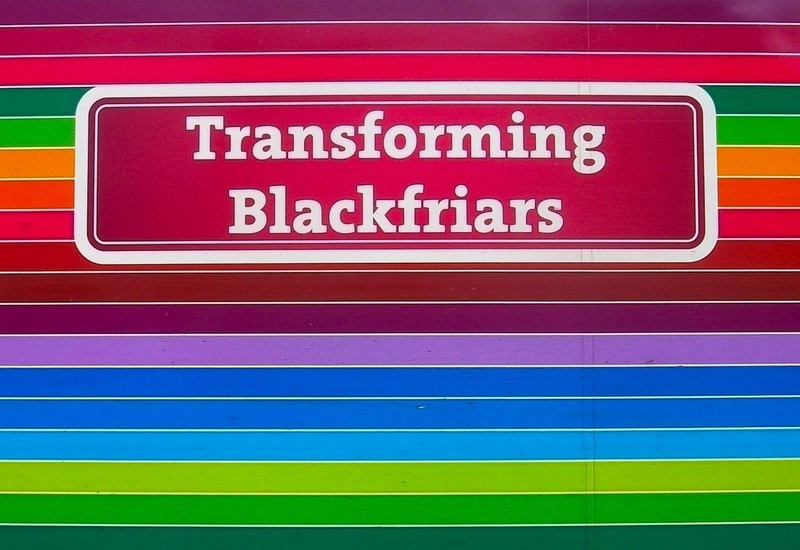 319364 'Transforming Blackfriars' nameplate. (c) Peter Skuce. Class 319/3 No. 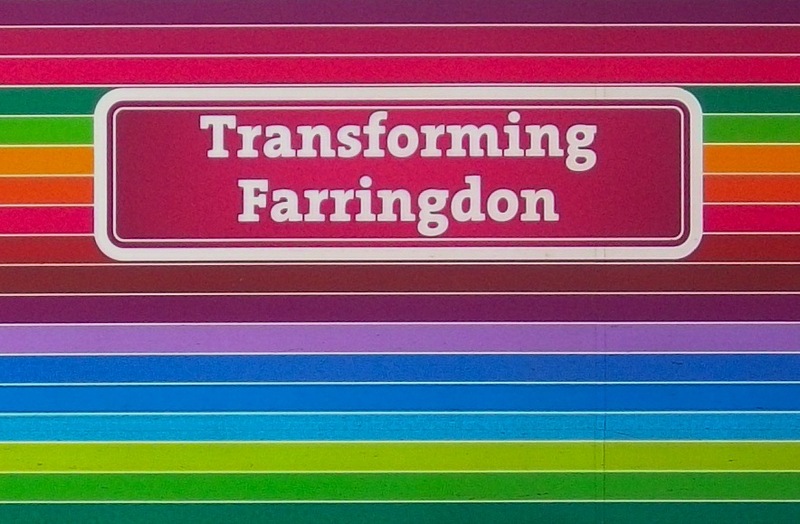 319365 'Transforming Farringdon' nameplate. (c) Peter Skuce. Class 319/3 No. 319365 'Transforming Farringdon' at London St. Pancras low level. (c) Peter Skuce. 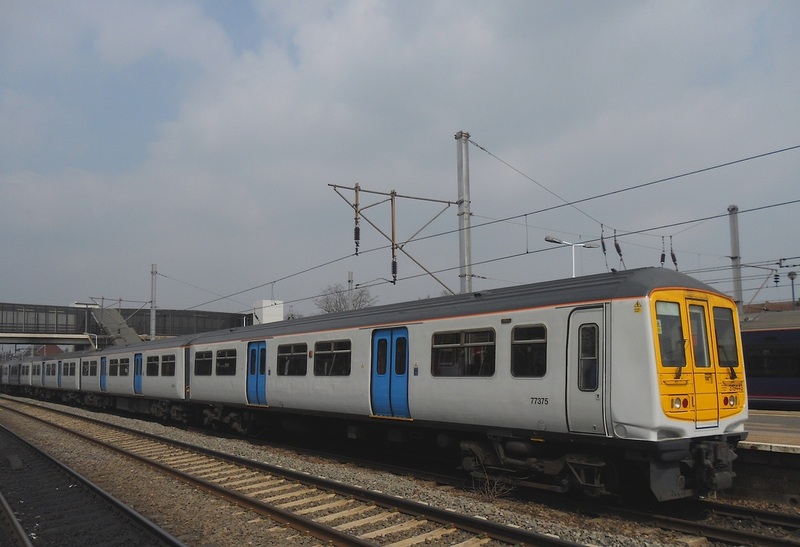 Note that this livery was Thameslink's third and final livery as the first livery was white/grey undercoat with THAMESLINK wording and giant logo on the bodyside. 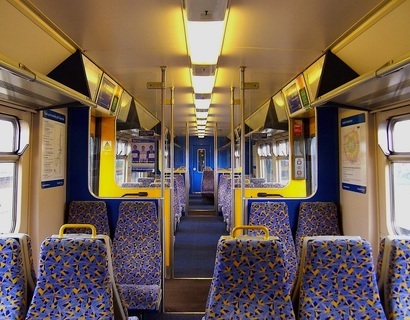 Then during the 1997 refurbishment, the trains were repainted navy blue with a broad yellow stripe and very narrow white stripes separating the yellow stripe from the blue - this was also when the trains received carpets throughout, retrimmed seats in blue/yellow moquette and the wall ends painted in blue (as seen from the interior shot). Finally the trains were painted in silver with blue window surrounds and a yellow one for First Class cabin. 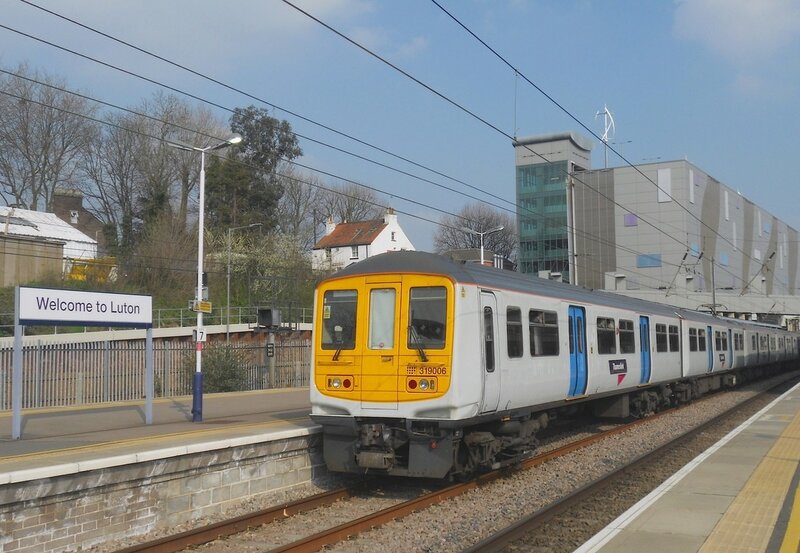 Thameslink Class 319/4 No. 319444 arrives at St. Albans. (c) Peter Skuce. Class 319/4 No. 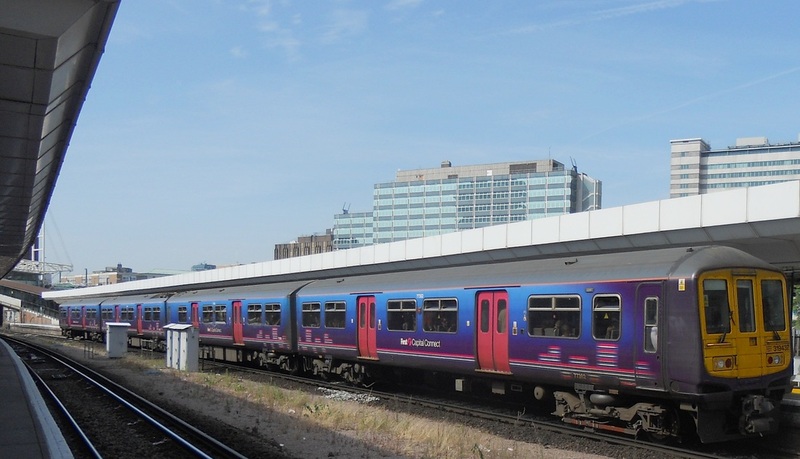 319423 at East Croydon. (c) Peter Skuce. Class 319/4 No. 319457 at St. Albans. (c) Peter Skuce. 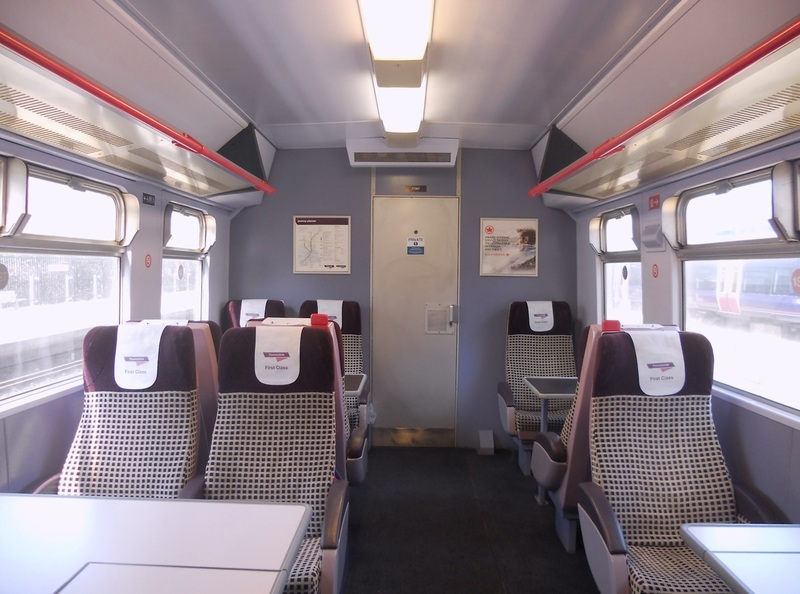 The interior of the refreshed Standard Class accommodation. (c) Peter Skuce. 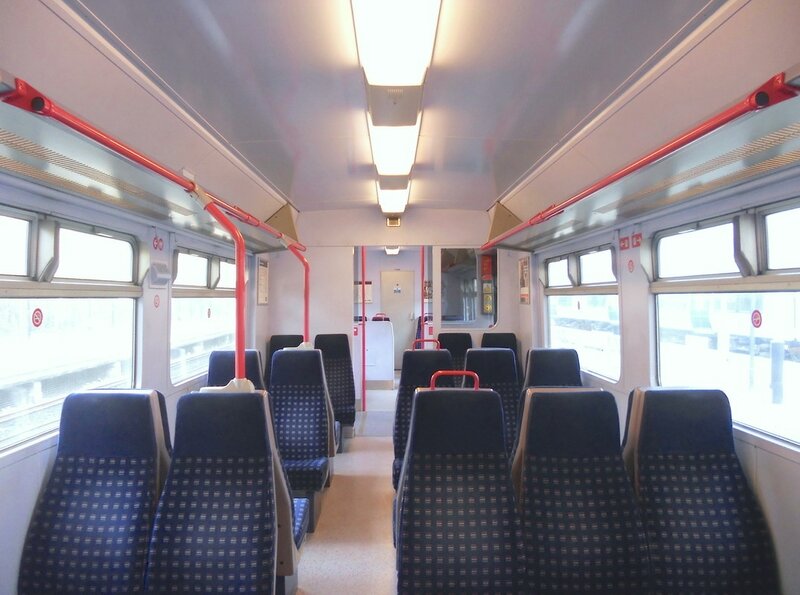 The interior of refreshed Standard Class aboard the TSO vehicle. (c) Peter Skuce. Class 319/4 No. 319428 at London St. Pancras. (c) Peter Skuce. 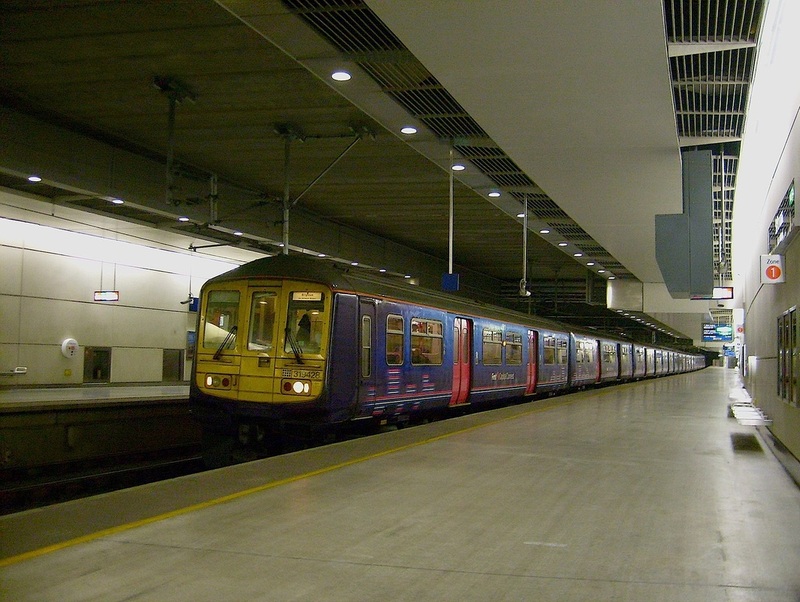 Class 319/4 No. 319437 at East Croydon. (c) Peter Skuce. 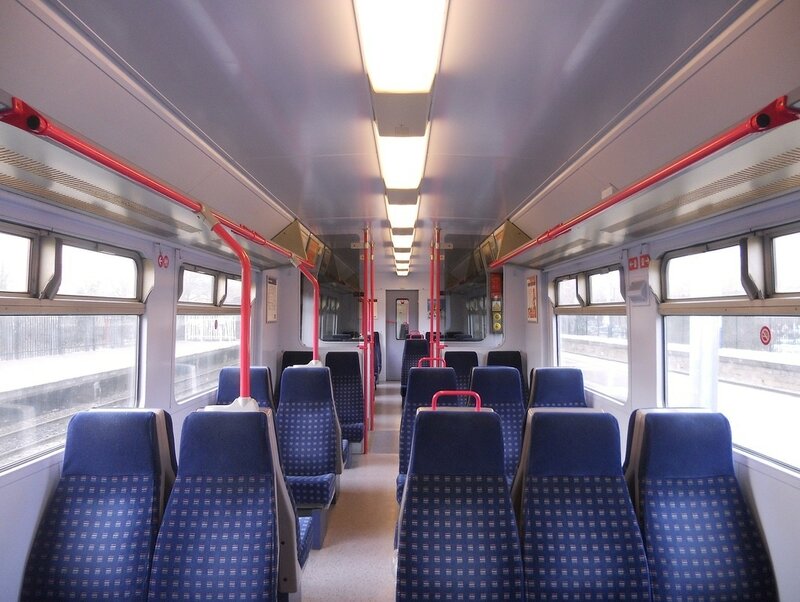 Thameslink Railway refurbished Class 319/0 No. 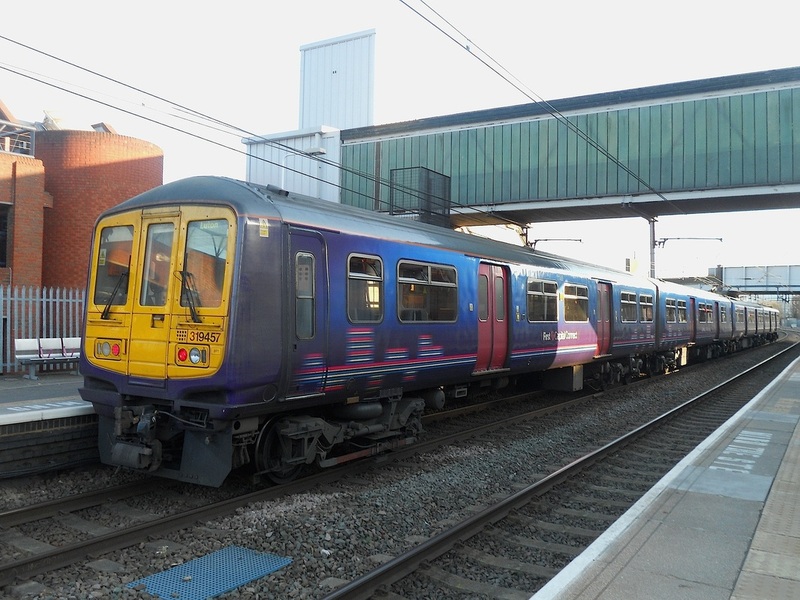 319006 at Luton. (c) Peter Skuce. 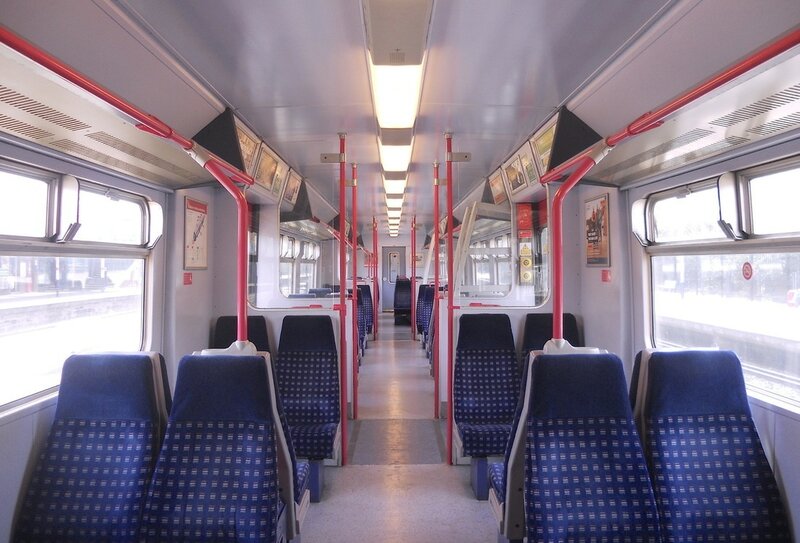 The interior of the refurbished TSO vehicle aboard a Class 319/0 EMU train. (c) Peter Skuce. 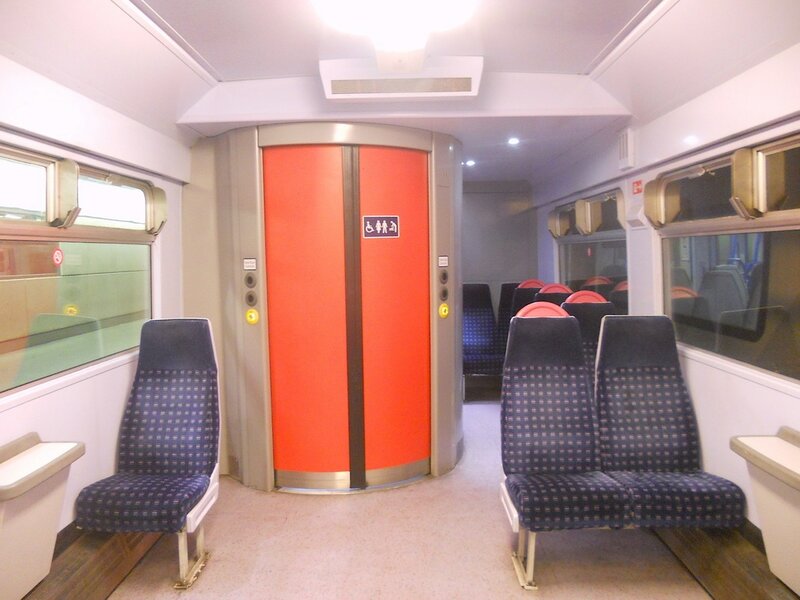 The universal accessible toilet aboard the Class 319/0 EMU train. (c) Peter Skuce. Refurbished with PRM TSI compliant features Class 319/4 No. 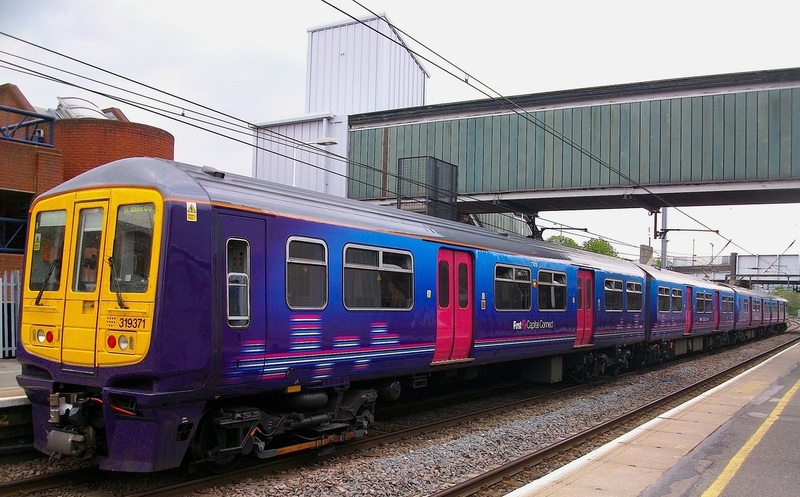 319438 at Bedford. (c) Peter Skuce. Refurbished with PRM TSI compliant features Class 319/4 No. 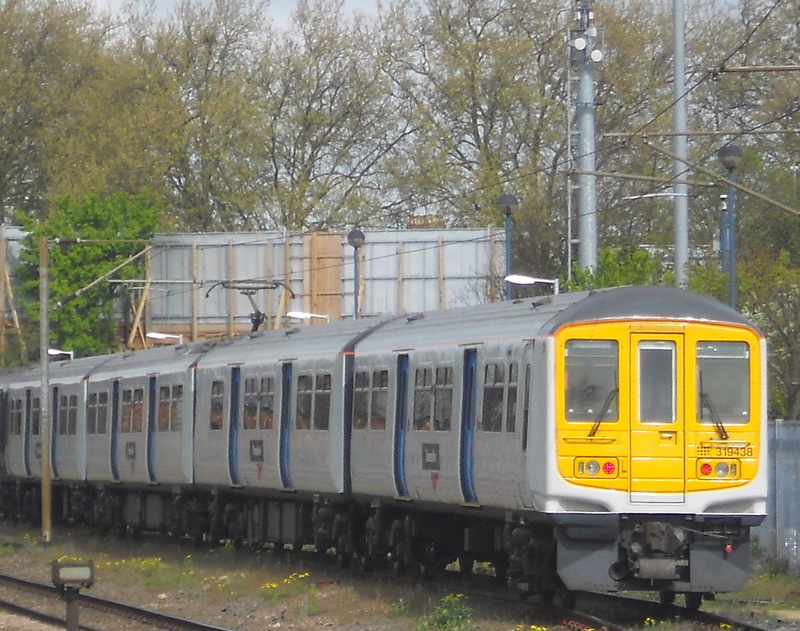 319443 at Bedford. (c) Peter Skuce. Refurbished with PRM TSI compliant features Class 319/4 No. 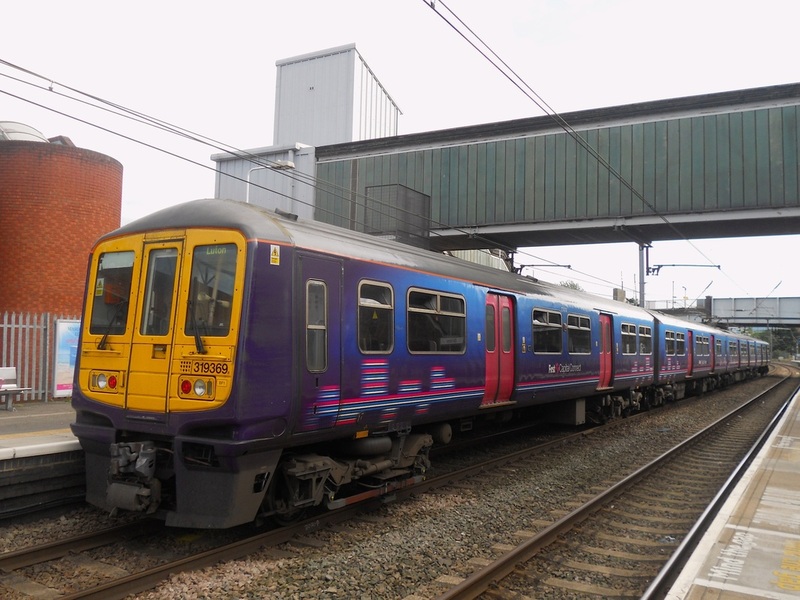 319447 at Bedford. (c) Peter Skuce. 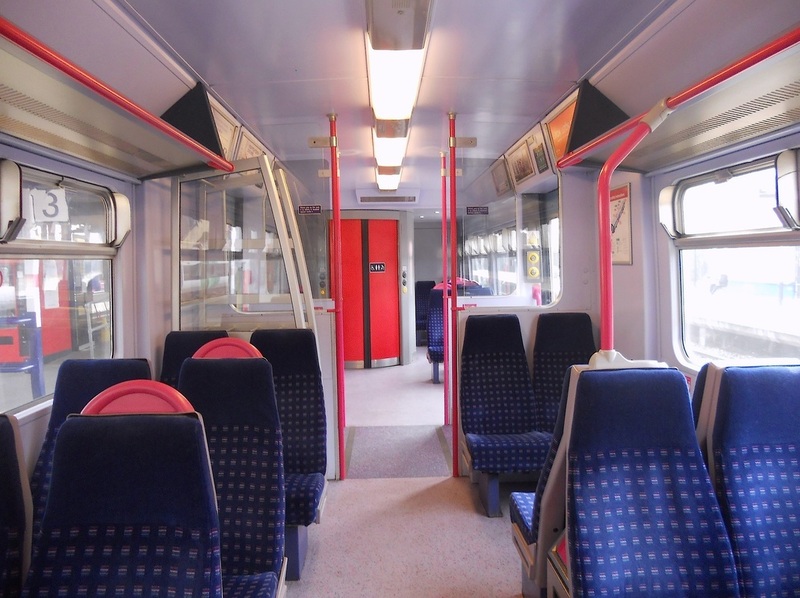 A half internal view of Standard Class aboard the DTSO vehicle. (c) Peter Skuce. 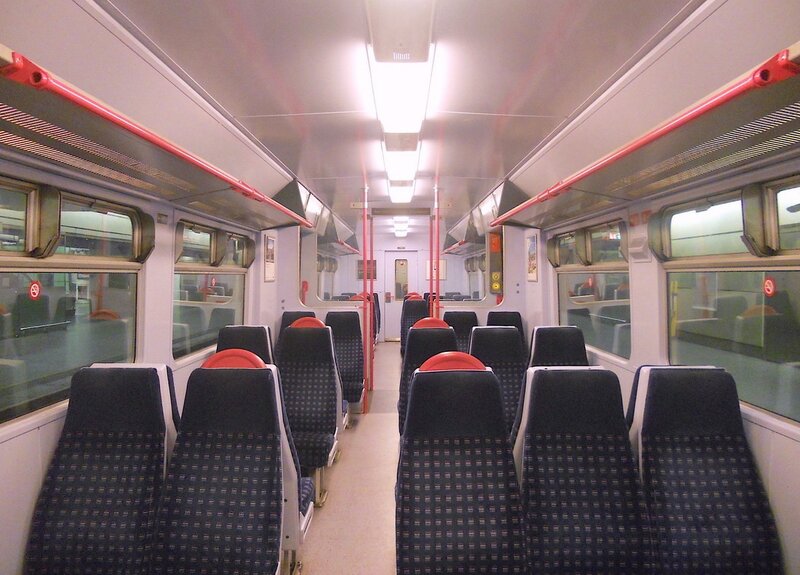 The interior of Standard Class aboard the DTSO vehicle. (c) Peter Skuce. 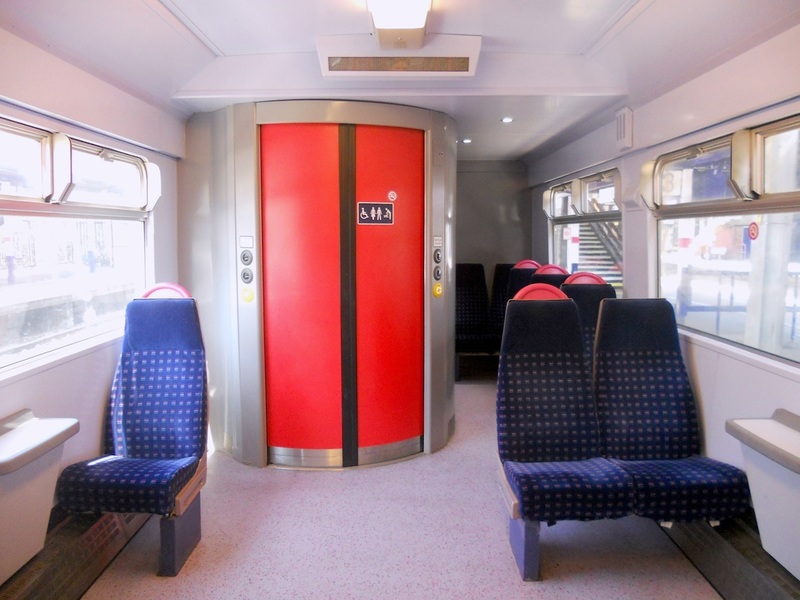 The interior of the TSO vehicle featuring the universal accessible toilet. (c) Peter Skuce. The interior of Standard Class aboard the TSO vehicle. (c) Peter Skuce. 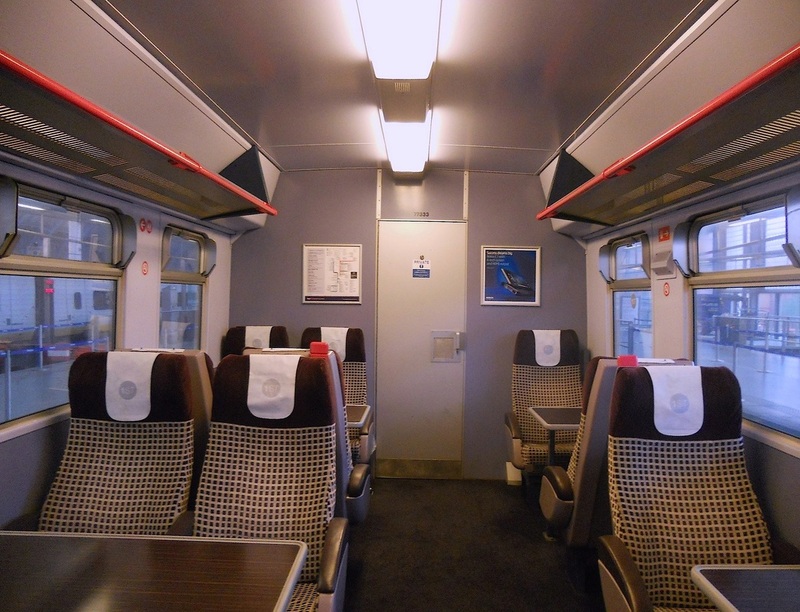 The interior of the First Class cabin. (c) Peter Skuce. 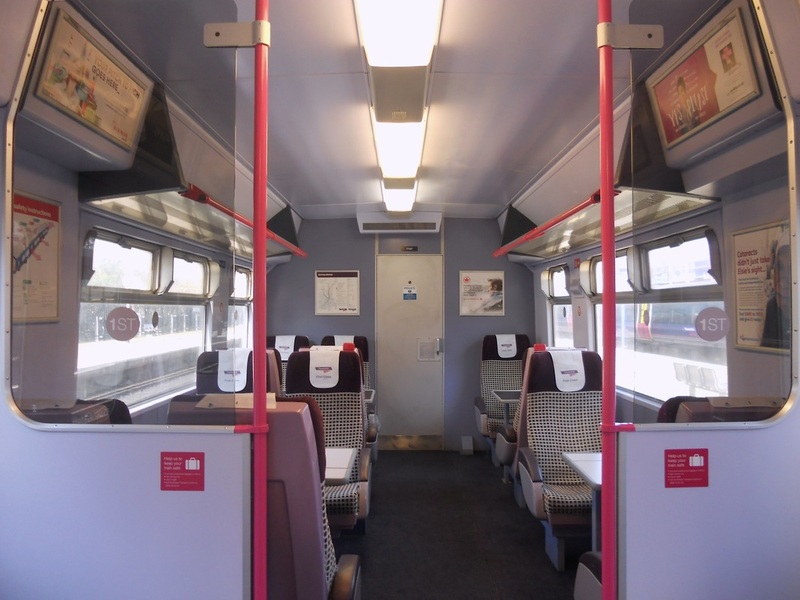 A half internal view of the First Class cabin featuring the two new folding tables. (c) Peter Skuce. 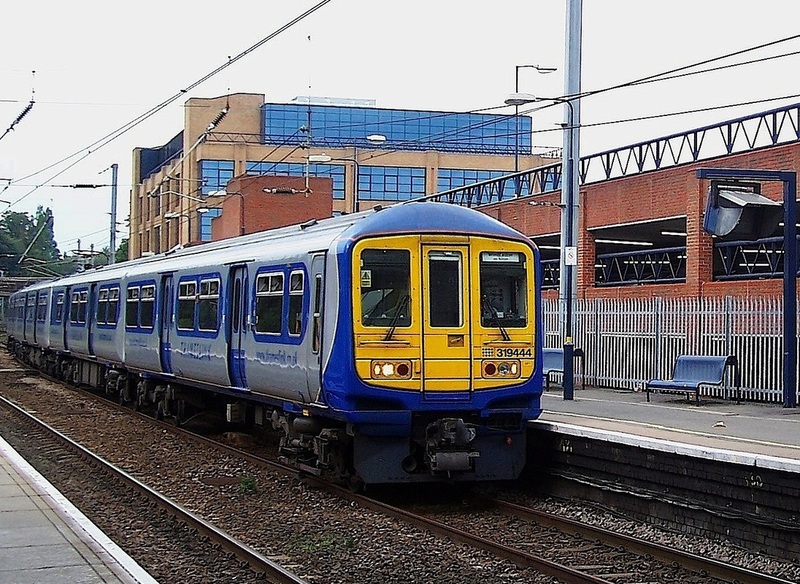 There are twelve Class 319/0 Thameslink EMU trains (319001 - 319012) and they were built by BREL York 1987 - 1988. 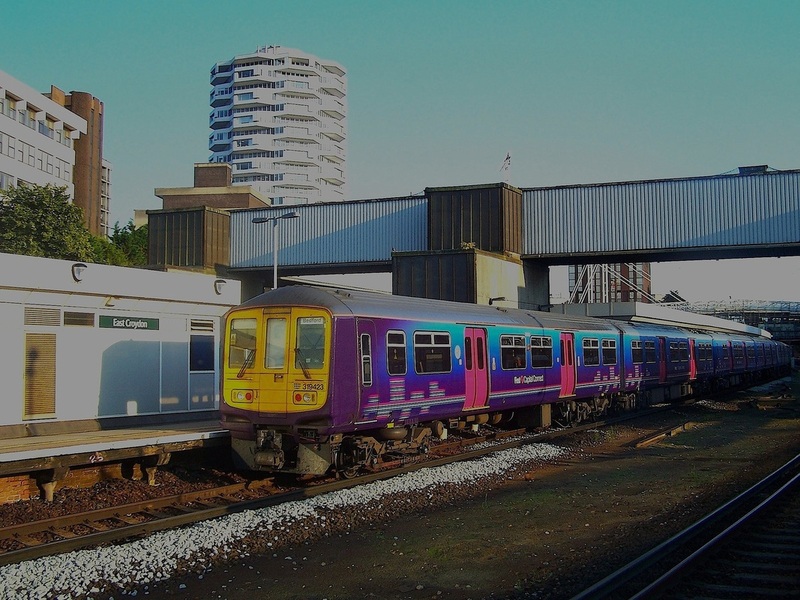 There are seven Class 319/2 EMU trains (319213 - 319220) and they were built by BREL York 1987 - 1988 as Class 319/0. 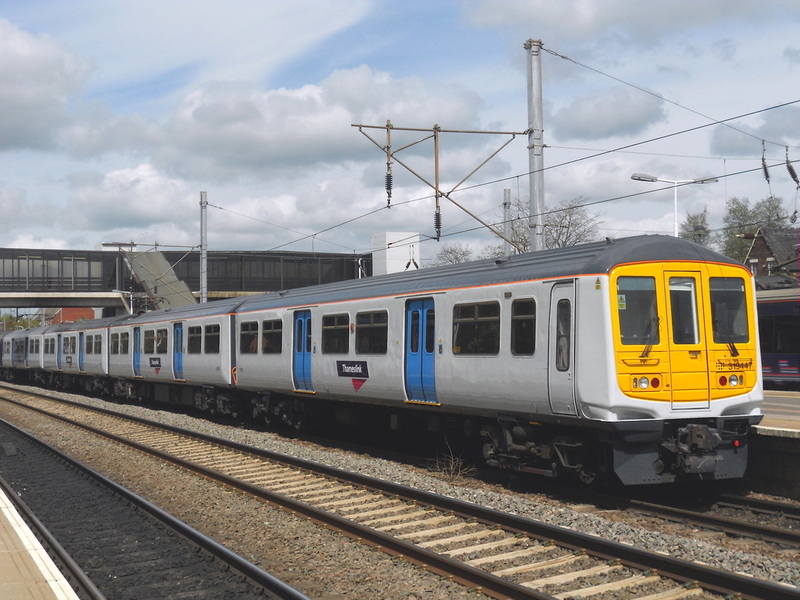 There are forty Class 319/4 Thameslink EMU trains (319421 - 319460) and they were built by BREL York 1987 - 1988 as Class 319/0. 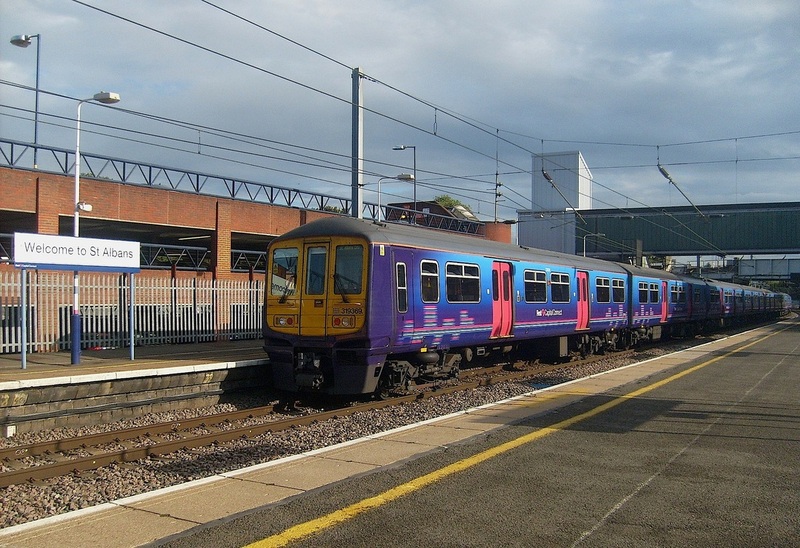 They were refurbished by Railcare Wolverton Works for Thameslink during 1998 - 2000. 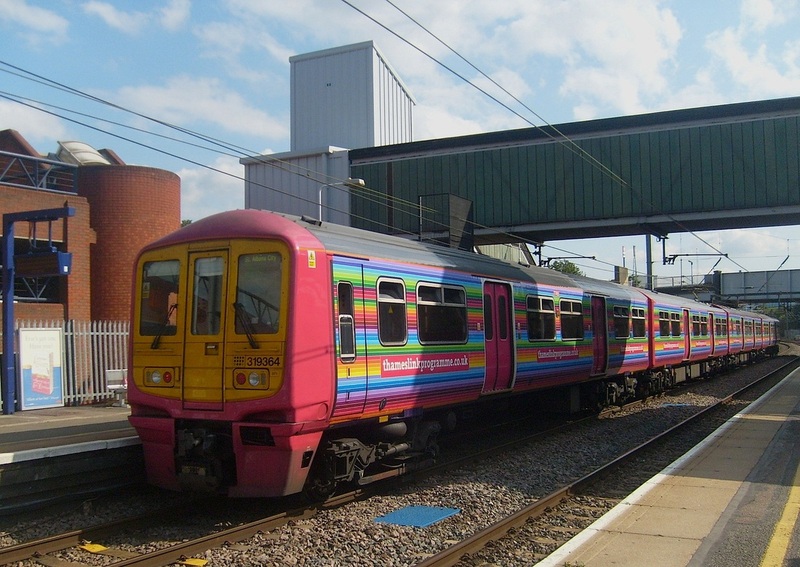 Their second refurbishment took place during 2008 - 2010 by Railcare Wolverton Works for First Capital Connect. 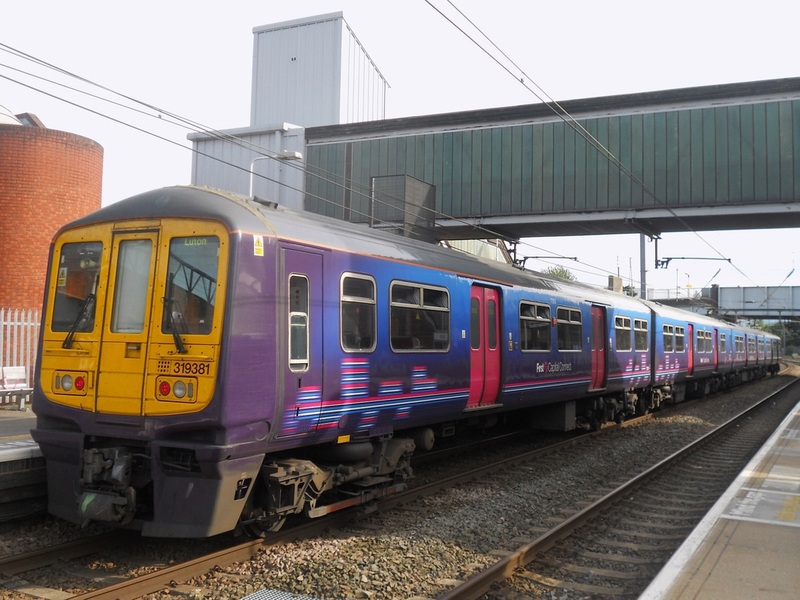 There are twenty six Class 319/3 EMU trains (319361 - 319386) and they were built by BREL York 1990 as Class 319/1. 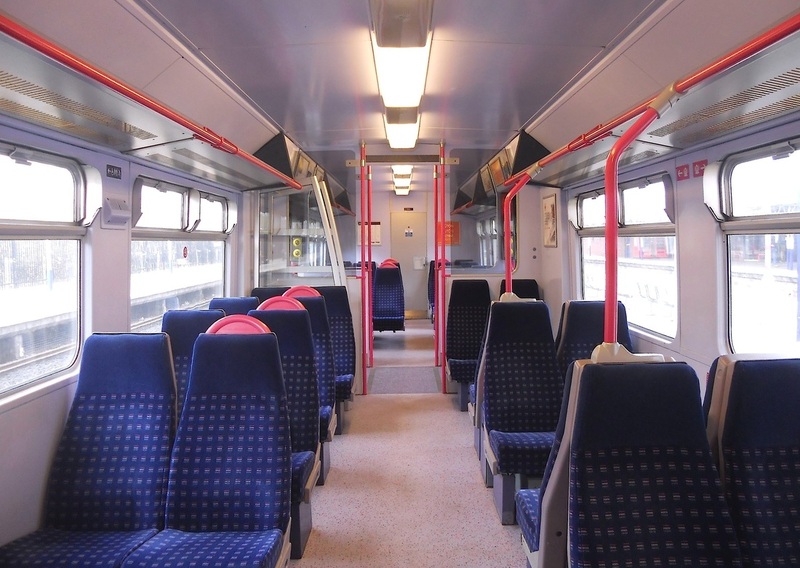 They were converted to Class 319/3 when the First Class cabins were removed. 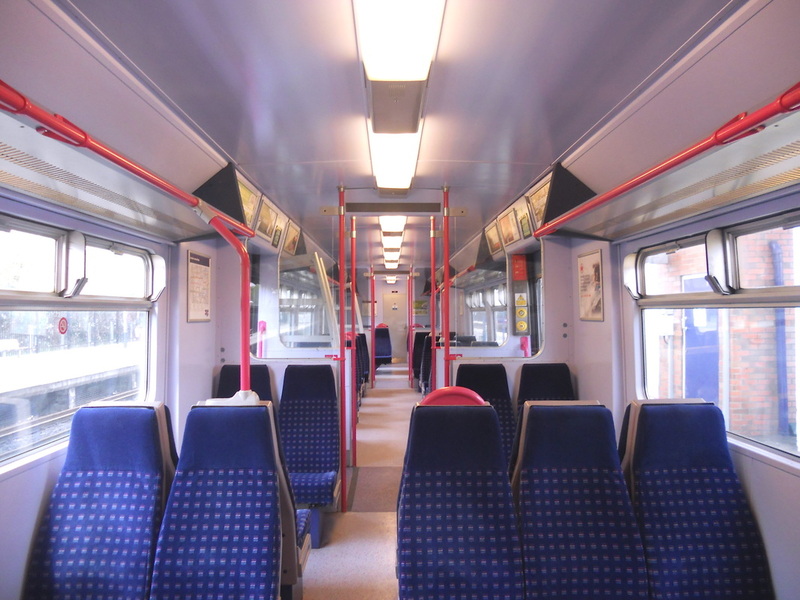 They were refurbished by Railcare Wolverton Works for First Capital Connect.